One of the many difficulties for transgender or gender non-conforming folk is to get an overview of what transgender life is like, and most importantly, what a typical transgender life can be. Until fairly recently, most transgender biographies have been hidden, whispered about, or recorded as oddities. And the CIS world has not been welcoming, treating trans* identity as a medical or psychological abnormality, instead of one of many normal progressions to finding one’s self. A major step to breaking down closet doors is to provide venues for trans* people to see themselves. Edward’s graphic novel does just that; focusing on the stories of six queer transmen. 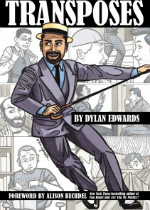 Edwards explains in his introduction that these stories are based on interviews he conducted with the principal characters, sometimes combining or altering them slightly to dramatize them for comics. He also states that the book isn’t about answering “those questions” strangers feel entitled to ask. It’s about the individuals who used the mediums of their lives to define what it means to be a FTM transperson. We meet Adam, who starts questioning his identity while in a lesbian relationship, then moves beyond standard therapy to transgender counseling, where his male identity blossoms (while at the same time, his lesbian relationship, by necessity, ends). There’s Cal, confident in his life and identity, but now navigating his first sexual relationship with a CIS man. While Avery’s story relates what it means to be genderqueer, where the gender binary isn’t relevant. All six stories cover a lot of ground and share a wide range of identity experiences (though sadly, there are not many people of color represented). Edward’s black and white comics are open and inviting, making it easy for readers to get a quick overview of many different queer FTM lives. This accessibility also makes Transposes a good resource for gender workshops or other situations where it’s helpful to easily compare different people’s life stories.